Indian weddings are like a grand gala with plenty of beautifully dressed people, having a wonderful time in gorgeous surroundings. The South Indian wedding is even more so with its affinity towards to exorbitant wedding decorations. The wedding stage holds centre stage as this where all the action takes place. The wedding stage holds the attention of the guests during the entire ceremony, making it critical that utmost care is taken about its decoration. 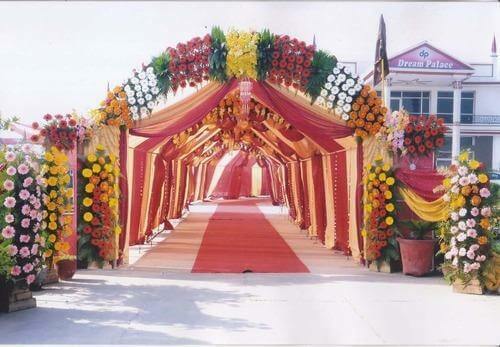 A hanging floral canopy over your mandapam will surely be of the town in no time at all. Additional embellishments like tiny temple bells, bangles, figurines can add a whole new look to the venue. Having a floral canopy on the stage fulfils the requirements of having flowers as well as having a unique mandapam décor at the same time. Getting married under a cloud of flowers is a popular choice for couples these days according to the best wedding decorators in Chennai. Satin drapes have been around for ages, with its shiny texture that is perfect for good photo ops. Interestingly, the satin drapes of today come with plenty of embellishments to give it a modern touch. Several hanging flower chains are set along with the satin drapes to give an ethereal look to the entire stage. Mirror hanging curtains have also caught the fancy of many couples and are being seen used along with the satin drapes in the recent wedding season. Flowers are an integral part of every Indian wedding. You can decide to have your entire stage decorated with fresh flowers to give it a heavenly look. The fragrance from these sweet smelling flowers is an added bonus as you get ready to say I do to your soulmate in front of all your family and friends. A South Indian wedding is after all incomplete without the fragrant jasmine and boisterous marigold. Some couples opt to have crystal hangings interwoven with the flowers to reflect light, adding a dash of elegance to the venue. This has paved the path to authentic bright glass bangles being dangled near the stage. The sweet twinkling sound they offer adds to the charm of the wedding theme. Indian Gods are a common feature of most South Indian weddings. A prominent idol or statue of the go is usually placed at the venue and is further decorated with plenty of flowers and diyas. The presence of the statue is believed to bring good fortune to the newlyweds. At the end of the day, it does not matter about the décor or theme. All that matters is that you have found your soulmate and will be embarking on the joyous journey called life!